Every area of the theme, ie: columns, row, and body; can be set to a fluid layout. Hide divs, widgets and content easily with hide classes at specified screen sizes. At 580px (a standard mobile device size) the entire body will become one single column and widgets stack on top of each other. Some adjustments to the header and footer will occur. 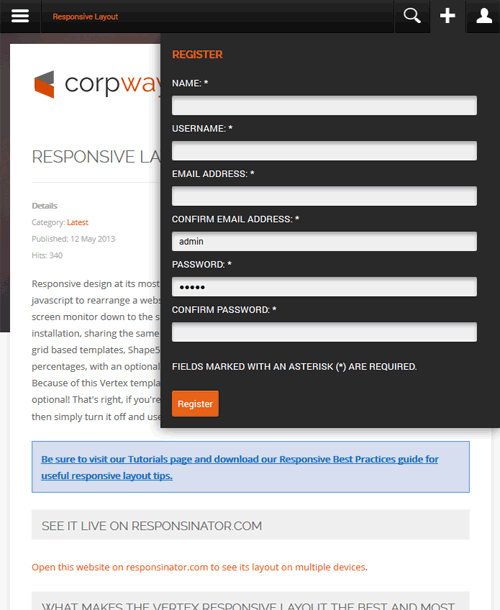 Please note - you have an option to use either fluid or fixed width columns (right inset, right, left inset, and left). We highly recommend using fluid columns when responsive is enabled. 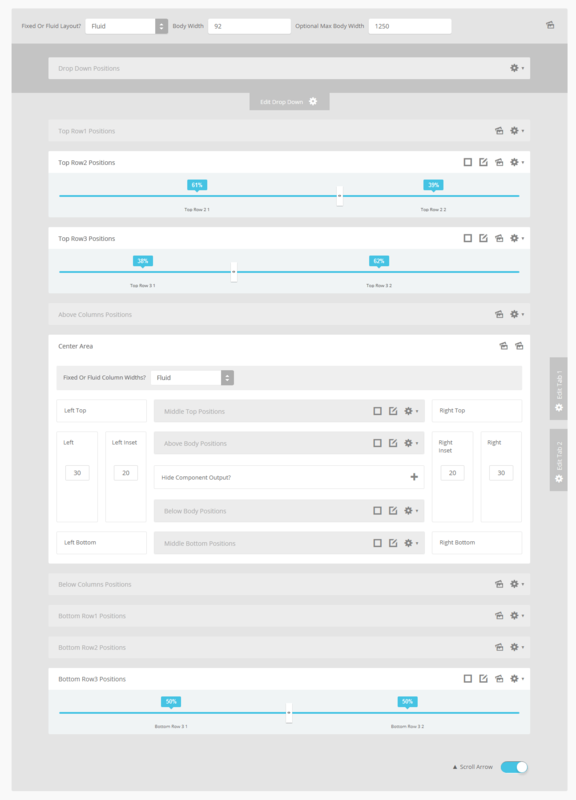 If you choose fixed widths there are other responsive options available for this setting as well in the theme configuration under the Layout tab. Each row in a Vertex theme contains six widget positions. If you are using a lot of widgets in a particular row the content can become squished when the screen becomes too narrow, specifically on smaller seven inch tablet screens. The row re-distribution features allow you to change the layout into multiple rows with new widget widths to give each position more room at specific screen sizes. You get to specify the screen width that this change will trigger at, and you can specify from several preset width options for each row indepent of each other. Single Column will set all widgets in that row to 100% and one widget per row. Two Columns will set all widgets in that row to 50% and two widgets per row. Three Columns will set all widgets in that row to 33.33% and three widgets per row. Redis. 33/50 will set positions 1 through 3 to 33.33% and positions 4 through 6 to 50%, this setting is meant to be used when positions 1 through 5 are in use. Redis. 50/100 will set positions 1 through 2 to 50% and positions 3 through 6 to 100%. Redis. 100/33 will set position 1 to 100% and positions 2 through 6 to 33.33%. Redis. 100/50 will set position 1 to 100% and positions 2 through 6 to 50%. This setting will override any custom row widths you set under the Row Sizes tab when the screen size reaches the selected width. All widgets will always change to a single column at 580px for mobile view. This feature is NOT available for IE7 or IE8! The general layout options are the ones starting with Enable Font Resizer? and ending with Right Inset Width. 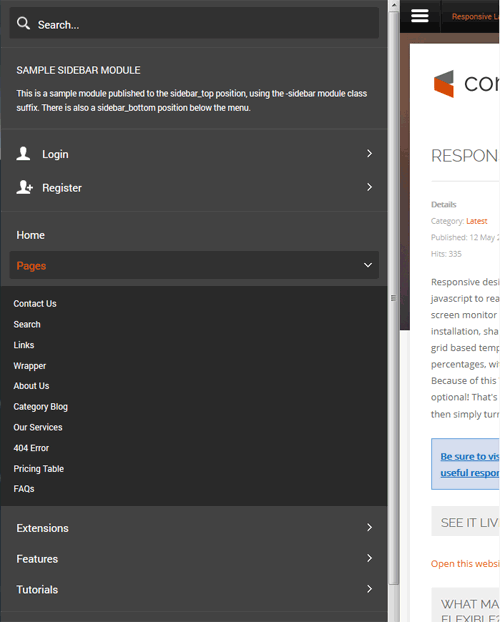 These parameters are the core layout options that apply to all themes, whether responsive is enabled or not. Configuring this area is the first step in configuring a responsive layout. You can choose to set the site to either a fixed pixel width or fluid percentage width, the responsive layout will work with either option. If you are using the fluid width option we recommend enabling the Max Body Width option so that that your site does not go above the set pixels; this helps keep your site looking proportionate across very wide screen. Depnding on whether you have set the side columns to fixed or fluid widths, you have several options to choose from. We do highly recommend fluid columns when responsive is enabled. The first option, which pertains to both fixed and fluid, allows you to combine posts, will set widgets published to middle top and middle bottom positions as well as posts published to the content area to a single column at the chosen screen width, this setting effects only those areas and nothing else. The settings below that are split into two sections depending on your column width setting. These settings effect combining the inset columns, creating a single column, and reducing the column widths. Be sure to read the tooltip of each section for a full description.